Some days I just feel really low, overwhelmed by expectations and tasks that seem to tower before me. The truth is, these days are usually not any different than the rest, except in that vast and seemingly infinite place, called my mind. Homemaking can be lonely, it can be tough, especially when it seems that no one appreciates or even notices the work done just to keep things running, not to mention everything else that is done on top of the bare minimum. I know in my heart, beyond the shadow of a doubt, that there is nothing that I would rather do--I think most of us who are homemakers feel the same--but that is not to say that there are never days of struggle. Homemaking is a high calling, though it does not command the validation or approval of those outside. It is a difficult calling, one that requires constant sacrifice. It is esteeming others--our families--above ourselves. Sometimes we just need a little encouragement and sometimes we also need to slow down. At times I realize that I have too much on my plate--too many distractions. I need to take a step back and look outside myself for hope and encouragement. I need to look to Christ. Saint Paul was someone very familiar with hard times, yet he constantly points us to the One Who knows our struggles best--Christ (Heb. 4:15). 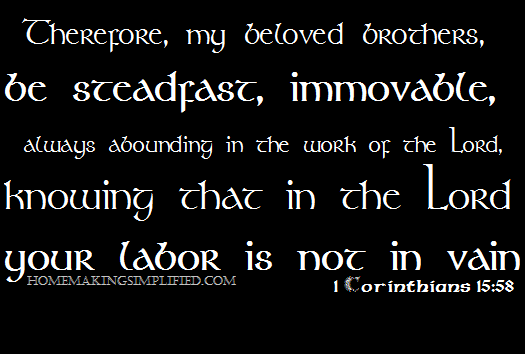 Therefore, my beloved brothers, be steadfast, immovable, always abounding in the work of the Lord, knowing that in the Lord your labor is not in vain (1 Corinthians 15:58 ESV). 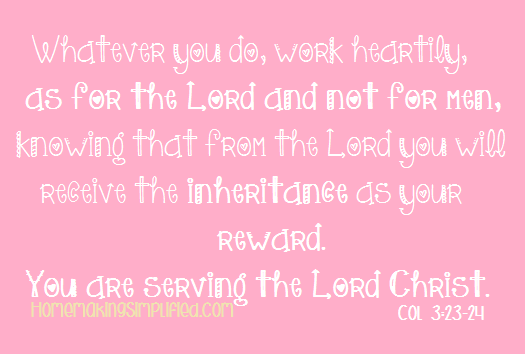 Whatever you do, work heartily, as for the Lord and not for men, knowing that from the Lord you will receive the inheritance as your reward. You are serving the Lord Christ (Colossians 3:23, 24).